Eco tourism has been a buzzword for quite a while. Many aspects of travel has been discussed - from purchasing carbon credits to offset fuselage to choosing an eco-focused destination that offers a chemical-free stay as well as holistic activities like yoga and meditation. What is not often discussed is the clothing, bags, and travel accessories that are used for the trip. To be eco, one has to factor in how an item is made, what materials are used to make it, how it's processed and finished. These are valid questions as the world now runs on mass production, with most garments being made in so-called "sweatshop" using synthetic materials (hence, not "natural" or "eco") or cotton grown using chemical fertilizers and pesticides. In 1997, when we started Rawganique, it became clear to us what we needed to do to fulfill our vision in making the purest eco-focused products possible, products that include a line of travel-related natural fiber clothing and travel accessories. To that end, we knew we had to control the production process from end to end. Today, we grow, weave, knit and sew many different items of natural fiber clothing, shoes, and bags at our small artisan-focused atelier. No sweatshop (our workers are paid fair living wages). Each item is crafted with love and care one piece at a time. We never use dioxin or formaldehyde in our products. No bleach. No toxic chemicals or dyes. That's our promise to you. We strive to make everyday products as natural and pure as possible. 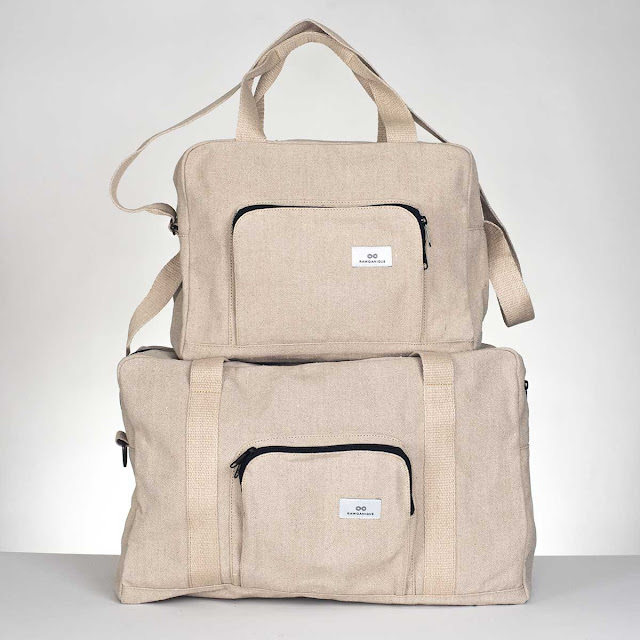 Browse through our line of organic cotton bags, organic linen bags, and organic hemp bags, as well as our organic clothing, shoes, and yoga mats and you'll see that traveling eco is more than just a buzzword. It's a way of life that starts at home and continues wherever you find in the world.